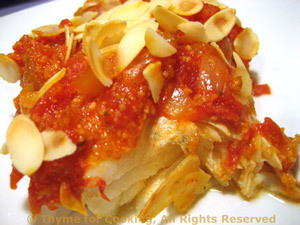 Bacalao a la Marinera, Fisherman's Cod, Thyme for Cooking easy recipe. This is a Spanish dish that would, traditionally, be made with dried, salted cod. I used fresh. In Spain you can buy the bacalao dry as a board or already reconstituted and rinsed. You can substitute any white fish: tilapia, snapper, mahi mahi; adjust cooking times slightly, according to thickness. Heat oil in a medium skillet over medium heat. Add onion, garlic and sauté until tender. Drain tomatoes, reserving juice for another use. Roughly chop the tomatoes. Add tomatoes to pan along with white wine and bay leaves. Bring to a simmer and let cook, uncovered, 5 minutes or until thickened. Remove bay leaves and stir in bread crumbs. Place fish in baking dish just large enough to hold it in one layer. Spoon the sauce over, sprinkle with almonds and cover either with a lid or foil. Bake at 400F (200C) for about 15 minutes, or until fish is done. Remove fish from dish, place on a small platter and serve.